We live in a culture of busyness! We never feel like we have enough time to accomplish everything we want or need to do, and the clock keeps ticking. According to the Merriam Webster Dictionary one of the definitions of busyness is “full of distracting detail”. The devil is in the distracting details! In a recent survey by Machael Zarelli approximately 13,000 believers were asked to respond to the following statement: “The busyness of my life gets in the way of developing my relationship with God.” Six out of 10 (or 60%) of believers responded that this is “often” or “always” true of them! Satan loves to keep us running in circles trying to beat the clock. If he can distract us he can minimize our usefulness to the Kingdom of God. What are we all so busy doing? Why do we act like we deserve some prize for how busy our life is? Do we find joy in being busy? Is exhaustion a badge we respect and honor? Or, is it a cover-up for our lack of joy? Are we afraid to be still? Perhaps we need to ask some tough questions about our busyness. Am I busy for the right reasons? God doesn’t honor laziness or wasting time. However, it is easy to fall into the trap of staying busy for the wrong reason. God intends us to care about all the needs around us, but He does not intend for us to try to do it all. 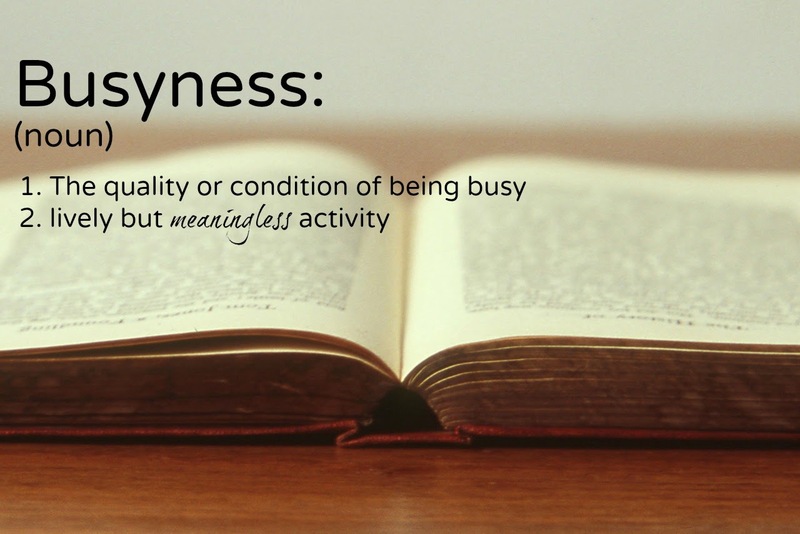 Has busyness become my identity? – Do I take pride in my busyness? Is my motivation to get praise and admiration from others? Our worth is based on who Christ says we are not on what others think of us. Do I set appropriate boundaries on my busyness? Jesus knew how to set boundaries (Luke 12) For many of us saying no is very difficult. The truth is sometimes God gives us permission to say no to serving others. We can be confident that when he does He will find another way to meet that need. Do I stay busy in order to avoid issues that need to be confronted? If we are busy, we don’t have time to think. If we are busy, there are no quiet moments when the convicting voice of God can get through. It becomes an escape mechanism. If we are staying busy because we don’t want to hear what God is trying to say to us, we must give it up and remember that God only wants good things for us. Is my busyness an obstacle to my spiritual growth? Is time with God what falls through the cracks then the schedule gets heavy? This is one of Satan’s best tricks – to keep us so busy that we don’t have time to read our Bibles, develop a meaningful prayer life or just to get to know God better. Perhaps the most familiar passage of scripture dealing with busyness is the story of Mary and Martha (Luke 10:38-42) From it we learn that it is not our performance but our presence that God values. Compiled lists and flawless events are not the lasting stuff of eternity. Only one thing is essential – sitting at the feet of Jesus. Truth to Claim: While all of us experience seasons of busyness they should not dominate our lives. God can be found in the stillness. Application: Evaluate your schedule not only with an eye for the necessary but the eternal.